I have a riddle for you. What is the one thing that everyone has access to, but very few understand how to effectively use? The answer is social media! Literally anyone can pick up a mobile device and start snapping pictures, tweeting or posting stories. While social media channels are easily accessible, brands can waste a lot of time (money) if they aren’t using these tools effectively or measuring social media performance appropriately. With all the activities that are possible with social media, how can you be sure that your efforts are generating actual business results? How can you measure the return on investment (ROI)? By following these five steps for how to measure social media ROI, you and your team can be sure your social media efforts are making an impact! First, we should be very clear on one thing: ROI doesn’t have to be financial. Of course, we all want to make trillions of dollars selling our products and services on social media. However, given the complexity of attribution modeling with social media, we often don’t get a linear picture of how people are interacting with ads from awareness to purchase. Therefore, ROI can absolutely be anything that is important to your brand, whether it’s awareness metrics, engagement metrics, conversions or revenue. As I said before, ROI doesn’t necessarily have to be dollars and cents. To begin to measure social media ROI, your organization must strictly define what metrics are most important to you. These key performance indicators (KPIs) will help you keep your focus on how you should be aligning your social media efforts and strategy. By clearly defining exactly what you are going to judge your performance on, you save yourself from getting distracted by metrics that are irrelevant to what you are hoping to accomplish with your strategy. For instance, if awareness is the goal of your social media strategy, you will want to include impressions and engagements as KPIs. If sales are what you want to focus on, you will want to include revenue and conversions. One misstep that many brands make is judging social media success strictly by conversions or sales. Given the nature of user behavior, people rarely see a social post, click a link and buy immediately. Users interact with multiple stimuli on the path to purchase, so it’s important to strictly define your KPIs, so you can get a holistic view of how your social media efforts are helping to build your brand. Once you have your KPIs identified, it is important for you to build a social media strategy aligned with your business goals. If you decide that you want to leverage social media channels to help build awareness for your brand, you will want to create a value-based content strategy supported by social advertising that is optimized to get as many impressions as possible. Facebook, Twitter, Instagram and Twitter have social advertising units that can help you achieve almost any purpose, so make sure you choose the correct one. For instance, if your goal is website visits, you won’t want to boost posts using engagement optimization. This means Facebook will show your content to people who are more likely to engage with it, not necessarily people who are more likely to click your links. There are a lot of pitfalls here, so be careful -- but as long as your social media efforts and strategy are built with your business objectives in mind, you should be one step closer to measuring social media ROI. Now that you have your KPIs in order, AND you have built a social strategy that aligns with your business goals, it’s time to make sure you can track website activity from social media sites. To start, it’s highly recommended that you leverage the Facebook Pixel. This little snippet of code will help you better understand the demographics of those who visit your website and will provide you with different attribution models that otherwise wouldn’t be available. Next, make sure that you have Google Analytics set up on your website and that you are leveraging UTM codes. These spiffy custom URLs allow you to track the activity of users that come to your website from a specific post or ad. You can get as granular as you would like! UTMs are a great way to begin assigning value to your social media efforts. With all the data that is created by your social media efforts, it’s inexcusable not to measure the impact of your activities. By using a reporting dashboard, you can view your performance for the KPIs that are most important to your brand. Many brands tend to look at each month in a vacuum; however, it is important to see trends over a longer period of time in addition to what the data looks like from month to month. Now, when I say “build a reporting dashboard,” I don’t mean you need to invest a ton of money in a custom solution. You can leverage tools like Google Analytics, Sprout Social and HubSpot to blend reports together, so you can create a dynamic view of your digital activity. This is where the reporting becomes very important, as you will want to look for both correlation and causation to piece together the story behind the data. This means understanding which social advertising campaigns are generating the most traffic to your site, at what cost and if that traffic is converting. The goal is to create a clear flow of what users do from when they are first served content to when they leave your website. THIS is where you can start to see the maturation of measuring social media ROI. Measure, measure, measure! I am going to contradict myself a bit here. While you can measure social media ROI in a lot of ways, you have to remember that you are almost always measuring the worst-case scenario. For instance, Google Analytics only reports conversions for social media if they happen immediately after the click. Therefore, if you are running a campaign and someone doesn’t convert immediately after clicking your ad, but then comes back later through a different digital channel, you won’t get credit. Many brands scoff at social media, because it seldom generates the direct conversions that other channels like PPC does. You must always remember realistic user behavior as it pertains to your social media efforts and view the data accordingly. A HubSpot study shows that 80% of consumers are out in the digital ecosystem researching products and services and only 20% of users are ready to buy at any given time. A vast majority of people aren’t ready to buy when they come across your social advertisements. Keep this in mind! 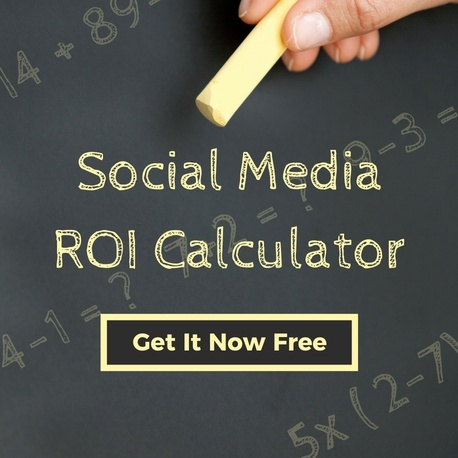 Measuring social media ROI is really tricky, but not impossible. As long as you are realistic about the data and the process by which you can measure social media ROI, you can get a clear idea of what your social media efforts are producing for your brand!